1) What inspired you to write The Chakra Energy Diet? Becca: Too many of my students and friends blame themselves for weight issues – and I wanted to get across the message that “It’s not your fault!” I feel America’s weight issues primarily stem from the physical stress put on our bodies by the fast food, junk food and GMO’s in most people’s diets, and the mental and emotional stress we encounter in our daily lives. I too have suffered from emotional eating, food cravings, unwanted pounds, aches and pains and other symptoms of an imbalance in my life. I knew that these symptoms were a gift – showing me that I needed to pay attention and change something – and I wanted to share the lessons I had learned. For instance, how to eliminate the harmful stress in our lives, which equals health and weight issues. Through years of applying Macrobiotics, Ayurveda and Chakra balancing in my life and the lives of my students, I wanted to share the changes people could make to achieve balance in their lives too. My previous books focused more on meditation, guided visualization, yoga and other chakra balancing techniques. The missing piece I felt to my message was diet – which, when out of balance, throws the body, mind and spirit out of balance as well. 2) What is the best way to avoid overwhelm while navigating through all the different chakras? Becca: The easiest way to approach chakra healing is to start at the beginning, with the Root Chakra. Follow the balancing techniques for each chakra and you will learn what works best for you. You can become your own best counselor, recognizing a symptom before it becomes a chronic pain or disease and make necessary adjustments in your lifestyle. 3) How do you recommend readers begin a yoga practice for optimal healing? Becca: For those who have never done yoga before, I recommend finding a local teacher with a beginner class. Talk to the teacher and tell him/her of any physical issues you may have so they can help adjust the poses for you. It’s hard to make adjustments yourself without someone to guide you. Even if you only have time to go to class one day per week, you can still do a short yoga routine that you’ve learned each morning to move from sleep to stretching into an energy-filled day. Be sure to hold your yoga poses and breathe into them for the recommended time to get the full stress-relieving benefits they provide to both the mind and the body. 4) You talk about the importance of nutrition and cooking; how do you recommend a newbie gets started in the kitchen? Becca: If you’re used to eating in restaurants or getting take-out every day, approach cooking as a great new hobby that will reap huge rewards for yourself and your family. I offer very simple recipes for each chakra in my book. Start with these easy dishes with just a few ingredients, for instance, organic whole grains and vegetables, salads, or even just a smoothie, and see how much better you feel when you eat food without unnecessary sugar, salt, pesticides or chemical additives. You can sign up for free Chakra Balancing menus at www.theChakras.org. 5) Many people complain of low energy; how do you see balancing the chakras as a way to increase energy? Becca: The chakras ARE our energy centers. If one or more are blocked or closed, your physical energy will be affected. And one of the biggest energy robbers is poor quality food that leads to intestinal dysbiosis, a compromised immune system and hormone imbalances that correlate to imbalanced chakras. Many people rely on stimulants like caffeine and sugary snacks to make it through the day, and then rely on alcohol or drugs to try to conquer insomnia – a seesaw that leads to chronic exhaustion. I recommend nourishing yourself with fresh, organic food and drink that is literally alive with vibrant colors, as well as specific exercises, yoga postures, affirmations and meditations to balance the chakras. These lifestyle ideas can help you to look and feel better, lose weight, reduce stress, and have sustained energy. To learn more about the seven major chakras and how they function in your energy system, please download my free 10-minute Chakra Meditation at www.theChakras.org/meditations.html. Thanks to Michelle Hastie, author of the book Chakra Secret, for interviewing me. 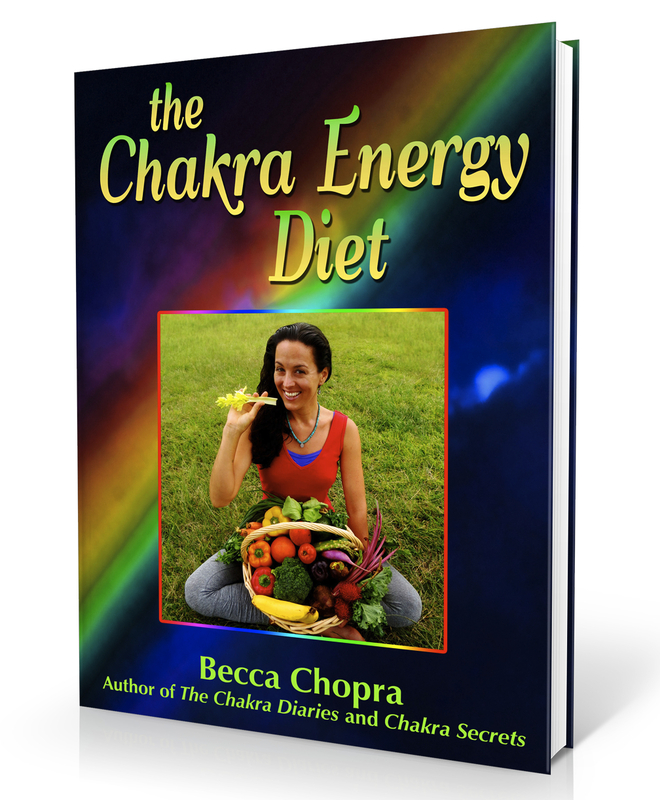 Why did I write The Chakra Energy Diet? So many of my friends and students have told me that they’ve tried every diet, but in the end, NO amount of willpower can stop them from gaining back the weight and more. Looking for answers took me right to the Chakras, and how we need to feed them with food that’s full of energy instead of processed, addictive, chemical-laden ingredients. Ann Doherty, RN, CDE, a Diabetes Educator, and Serge Kahili King, PhD, a Huna healer, added their extensive knowledge on how we’re sabotaged by our own bodies’ stress responses and by the food industry to have cravings and overeat. Even better – they offer stress-busting solutions. Look with me at which of your chakras have been stressed, and follow my easy suggestions to quickly move into balance. There are so many things that I love about this book; first and foremost is that Becca Chopra shares her extensive wisdom to help you optimally feed not only your physical body, but your subtle, or nonphysical body, as well. And she does this in a very balanced way, providing a virtual treasure chest of tools that include real, health-giving foods; meditations and breath work; affirmations and healing activities, and specific yoga poses. Becca begins by pointing out the breakdown in the conventional American diet, which is loaded with sugar, processed foods, GMOs and soda. Then she points the way to a better way of eating that actually nourishes body, mind and spirit. She also speaks at length about how stress and your own insecurities about your body can stand in the way of you reaching your health and weight goals and how you can lift those blocks. Next, taking you on a systematic journey through your chakras, Becca introduces each of these seven major energy centers to you and helps you to pinpoint your own weaknesses and imbalances. She then offers a wealth of information for you to use in nourishing your physical body and revitalizing your chakra system. The book ends with appendixes that include a “Chakra Yoga Flow” sequence to balance your seven chakras and also “The Circle of Joy Breath” that integrates Body, Mind and Spirit. The instructions are clear and detailed enough so that even a beginner can complete the sequences. All in all, this delightful, easy-to-read guidebook is a feast for the senses served up in Becca’s expressive writing style, complemented by beautiful photography of food recipes and yoga poses. 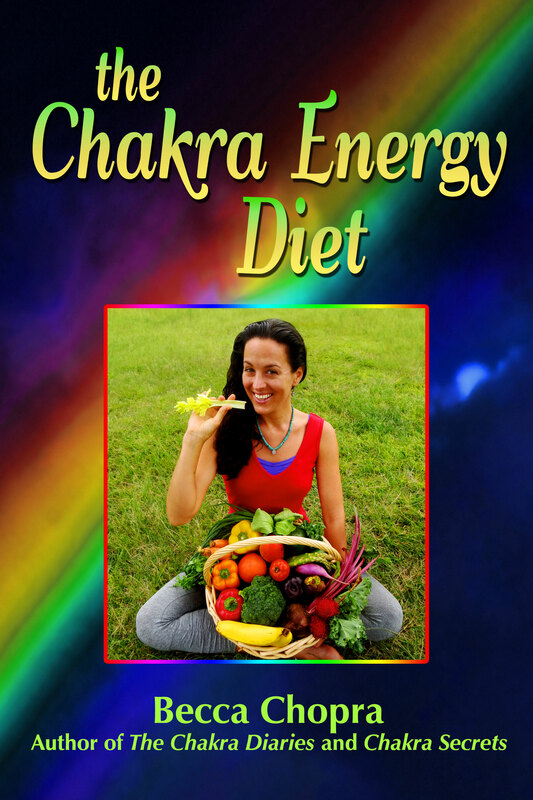 Learn how to increase your energy, reach your optimal weight, and nurture yourself with the right foods, stress-busting techniques, yoga and exercise… start The Chakra Energy Diet today. For ongoing support, download my FREE MEAL PLANS also. Since publishing The Chakra Energy Diet in April, I’ve gotten great feedback on how it’s helped people to conquer stress, weight and self-esteem issues. Most of all, it’s helped them to pinpoint which of their chakras needed balancing – and how to go about it. I want you to experience that freedom as well, so as we come off Independence Day weekend, I’m offering the book FREE FOR DOWNLOAD, JULY 7 & 8 on Amazon Kindle (available to read on most any device). Part I of the book explains how we’re both psychologically and physically sabotaged by stress to overeat and crave sweets, and how GMOs, pesticides and refined sugar and other addictive ingredients in our “food” products further stress the body… in other words, it’s not your fault! “The author did an excellent job in presenting a comprehensive set of information on balancing each chakra: first by examining the emotional components, then by providing the most desirable foods and meditation mantra pertinent to specific chakras, along with relevant yoga postures and exercises. Interesting recipes with pictures are added bonuses. For more information on Becca Chopra’s work, see www.theChakras.org. Buy the book and get FREE bonus meal plans for each chakra. Reviewer Marya Mann is co-author of Healing Our Planet, Healing Our Selves. Dr. Marya has over 50 state-of-the-art tools that clear old “tapes,” dissolve pain and have you visioning your best future immediately. Also Advanced Micro-Nutrition, Energy Balancing and Life Coaching and can be reached at www.maryamann.com.